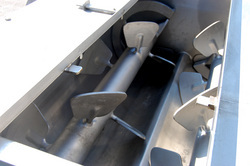 STEAM JACKETED PADDLE BLENDER, TWIN SHAFT, STAINLESS STEEL, with end bottom outlets; Rietz Model RS15-K5603-6. 30 inch wide by 42 inch long by 20 inch deep (approximately 14 cubic foot) vessel manufacturer rated for 500 lb capacity. (2) 7 inch high by 12 inch wide spade shaped pneumatically operated end discharges. The vessel bottom is externally covered with a stainless steel steam jacket manufacturer tagged and National Board coded for 60 psi at 308 degrees Fahrenheit. 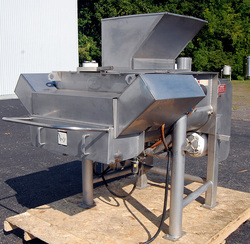 Complete with a removable top cover with a 24 inch square feed hopper which tapers to 12 inch by 24 inch. (2) 3 HP 3 phase 1750 RPM drive motors with gear reduction. All food grade sanitary stainless steel construction. As of this writing, this 500 lb paddle blender / paddle mixer is in stock in good operational condition, available for timely shipment. This page contains a single entry by Michael C. Shults, Alard Equipment Corp published on August 23, 2013 3:56 PM. y1889 was the previous entry in this blog. y1667 is the next entry in this blog.